BOCA RATON, Fla. -- After two days of intensive debate about potential head-hit legislation and concussion prevention, the League's general managers spent their final day here discussing a myriad of other issues affecting the game. Wednesday's discussions mostly revolved around video review protocols, the possibility of adding a coach's challenge and the rules governing the legality of shootout attempts. The concept of using shallower goal nets also was discussed as a possible way to create better passing angles, more maneuverability behind the net and facilitate the ability of attacking players to attempt warp-around tries for goal. There also was a fair bit of discussion about re-working the annual NHL/CHL Top Prospects Game to perhaps add more testing elements to the game. Hybrid icing, expected to be a topic of discussion here after being exhaustively looked at during a research and development camp held by the League this summer, did not make it onto the agenda. But there was no denying head hits and concussion prevention were the main topics during the past 72 hours. And for the most part, the GMs believe they have addressed the issue in a sufficient way. During the past two days several proposals have been advanced to address each of those concerns, including the formation of a blue-ribbon panel to look into player safety, the adoption of a five-point plan to make the game safer and a recommendation for tighter enforcement of the charging and boarding provisions already in the NHL Rulebook. "This is a pretty big step in making the game safer," Carolina GM Jim Rutherford said. "I'm satisfied with what we've done here." With several high-profile head hits still in the news when the GMs convened here, the calls for wide-ranging legislation to improve player safety were omnipresent. However, even those GMs that were among the most aggressive in their suggestions to address this issue believe serious work was done here. "We're going to see, in time, how things go," Pittsburgh's Ray Shero said. "I think it's a step in the right direction. Certainly, I'm a proponent of zero tolerance. Short of that, when we start to tighten up some of the rules we already have -- more aggressive calls, more aggressive suspensions moving forward -- certainly that's a step in the right direction. "I'm not sure we were going to get (zero tolerance). As I said, the game's evolving and we've got to evolve with it." The recommendations made at these meetings will go to the Competition Committee and then the Board of Governors for approval at its meeting in June. 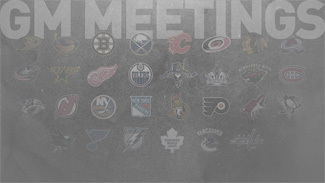 The GMs also will have more points to discuss when they reconvene for a quick meeting at the Stanley Cup Final in June. The expansion of the scope of video replay and perhaps the addition of a coach's challenge could be at the forefront of the June discussions, judging by the chatter Wednesday. For many, there is a clear mandate to get the scope of video review widened. Presently, replay only can be used to determine the legality of goals. However, there were suggestions that it be used for other issues, specifically including four-minute high-sticking penalties. Some suggested the inclusion of pucks off the protective netting, goalie interference and offside as reviewable events. "There's a sense the GMs want to get it right and that would mean adding some of the situations that are reviewable," said Toronto GM Brian Burke. "Right now video review is only applied in a very narrow set of circumstances. I think there's a couple of guys who would like to see that expanded. "I worry about what that does to the time of the game, I worry about how far back in time a review is allowed to go, I worry about the different camera angles in different buildings. I think the GMs are going to make that case in memo form and we'll consider it." They also may consider a coach's challenge, similar to the one employed by the NFL, that would allow for certain on-ice rulings to be reviewed on-demand. "It could be used to call attention to one particular situation. I actually have a lot more time for the potential coach's challenge than I did when it was first brought up," Buffalo GM Darcy Regier said. "I think that is the nature of it. When somebody introduces something, usually the first thing you hear is, 'No, that's a bad idea or stupid idea.' Today, more listened." There also was a heated debate about the shootout procedure as the legality of the spin-o-rama technique has been questioned by players and general managers. Basically, there is a concern that these shots violate the shootout rule that demands the puck be moving in a forward direction throughout the attempt. "Spin-o-ramas are an accepted part of the shootout," Minnesota GM Chuck Fletcher said. "That's how it's evolved. But are the new moves crossing the line? And what's next? What's too far?" "There was a lot of discussion on it and as per the criteria of the rule, the spin-o-rama walks a fine line of being legal by definition of the rule," Tampa Bay GM Steve Yzerman said. "So it was discussed at length. I think it will be discussed further." San Jose GM Doug Wilson has been coming to these meetings for several seasons and said the current edition is one of the most productive he has attended. He especially liked the amount of data the League provided on concussions and the hits that caused them, referring to an exhaustive study commissioned and executed by the League's Hockey Operations department that charted each concussion during the 2010-11 season and identified the type of hit that caused the injury. "As a general manager, I would say it's one of the better meetings we've ever been part of," Wilson said. "After the trade deadline, you're focused on the game of hockey. The GMs take it very seriously that we take a look at how we want the game played and the rules enforced and the safety of players. "This meeting with the timing of it, the breakout groups being larger groups, much more interest. The research was done by the League on actual data so that you're making decisions on fact and not on guessing and pulling things out of the air."